Sisson Dupont Carder offers plank flooring in 1” x 12” square edge Ponderosa Pine. Finished with concrete or a “flat cut” nail the wide board gives the look of authentic plank flooring”. If you are looking for value you may want to try our newest flooring product. 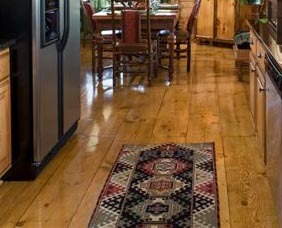 Our 1x6 flat edge cabin grade tongue and groove flooring offers a rustic look at an unbelievable price. Contact us for our current sale price on the cabin grade.